KX180SUB is a professional low frequency subwoofer. The design can be used in a transportable PA and music/sound system, fixed entertainment installation, or multi purpose room system. It extends and enhances the low frequency sound when combined with any KX series full range speaker system. The KX180SUB uses a 18" professional woofer with dynamic power handling. The cabinet is a bass reflex design to minimize cabinet volume while still producing large sound pressure levels with minimal distortion under high compression. It includes a carry handle for convenient transportation and installation. The finish is in high strength black wear-resistant coating. 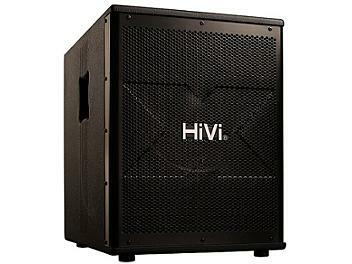 The HiVi X front mounted steel grille protects the unit effectively and has no resonance at high volume levels.